You might recall me telling you how obsessed I am with quinoa these days. 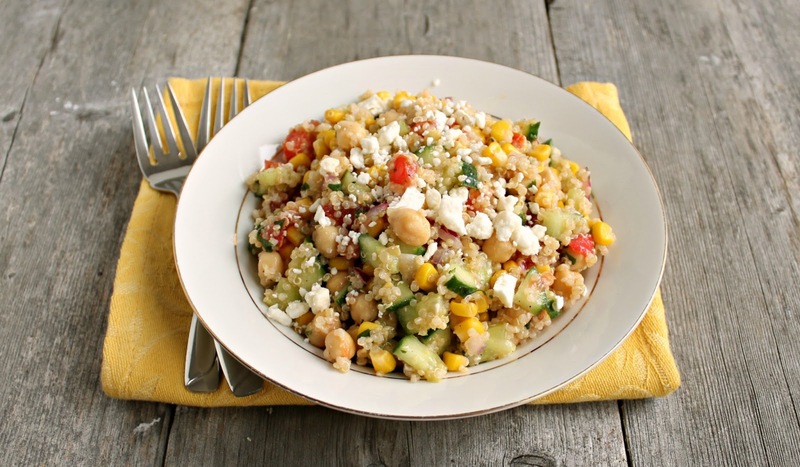 I've given you a couple of my favorite recipes for Quinoa & Chickpea Salad with Lemon Tahini Dressing and Cheesy Quinoa & Asparagus Bake but what doesn't come across is how often I eat those. Honestly, I can't even recall the last time I ate potatoes and I love potatoes. 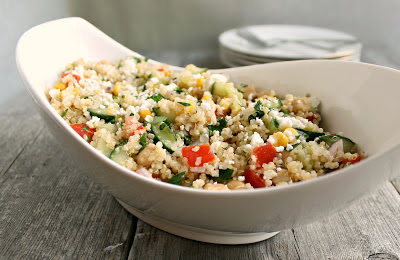 But the quinoa obsession keeps winning when I'm deciding what to make for dinner. The fact that it cooks so quickly doesn't hurt either! But dinners aside, there's also lunch to think about and I love having some kind of bean or grain salad in the fridge for easy, healthy mid-day meals. I considered making tabouli with quinoa but decided that I didn't want to be restricted to a classic tabouli recipe. So the basic premise is here - cucumbers and tomatoes. 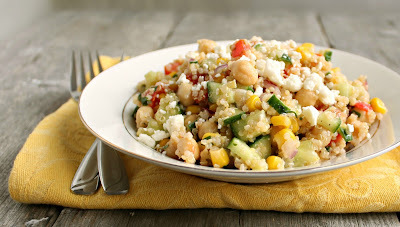 But I also threw in my other lunch obsession, chickpeas, and some tangy crumbled feta cheese. The lemony dressing goes so well with all these ingredients and it's just lunch heaven. Since Brian loves it as much as I do, it's pretty hard to keep this around for any length of time. Enjoy! Rinse the quinoa under cold water for a couple of minutes and place in a pot with 1 1/2 cups of water. Bring to a boil, cover and reduce the heat to low. Cook for 12 minutes then turn off the heat and let stand, covered, for an additional 5 minutes. Remove the cover and allow to cool to room temperature. Make the dressing by combining all the ingredients and whisking until thoroughly blended. Add the cooled quinoa, chickpeas, corn, cucumber, tomato, red onion and parsley. Season to taste and top with the crumbled feta cheese. Makes approximately 4 servings. I'm obsessed, too! Your salad looks terrific, Anita! Is this quinoa? Okay, I'm in. I think my daily sandwich for lunch routine needs a break. And that break starts with salads like this one. What a beautiful and light summer salad... Gorgeous! The salad looks beautiful. Light and colorful is just what I want in the summer. I've had a bag of quinoa in the pantry For-EVER, I need to make this! Yum, this looks delicious! My huband has declared this the summer of salads, so I'll definitely be trying this one out! Quinoa is one of my favorite foods. It's so versatile, isn't it? This looks like a refreshing summer salad for sure! You sure make this look wonderful!! Looks delicious! Thank you for sharing with Foodie Friends Friday! I made this for dinner last night. Fantastic! Thanks for sharing your recipe. Ice Cream and Berries and Cake, Oh, My!